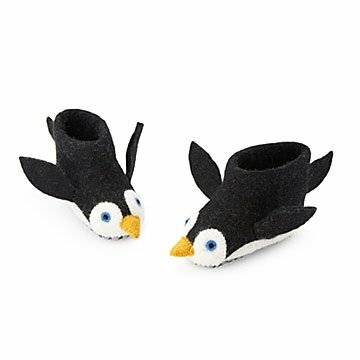 Play "march of the penguins" (minus the Antarctic expedition) with these adorable slippers. Every winter, emperor penguins trek 50 miles across the Antarctic ice—that's quite a journey when your legs are only a few inches long. These adorable felt slippers for kids are intended for less extreme expeditions, like padding back and forth from the living room to the playroom. Crafted from felted organic wool with delicately sewn and cross-stitched features, they're playful complements to spirited little personalities. Presented in an organic cotton drawstring pouch. Designed in the UK. Handmade by artisans in Nepal.